EDIT: The video has been removed from youtube, but you can check out her makeup process on the Bonus features of the DVD and Blu-Ray releases. Ever wonder about the processes involved for making realistic monsters and mutants, like the ones in the X-Men First Class movie? 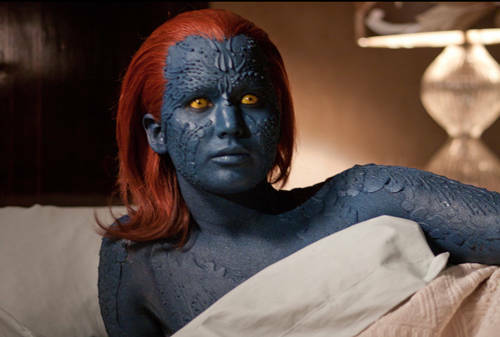 This next video gives us a glimpse on how the makeup artists put together the mutant Mystique, who of course is completely covered in scaly blue colored flesh. Apparently it takes many hours, as it is all done by hand and no CGI is involved. Jennifer Lawrence who plays Mystique, is seen explaining some of the procedures involved, and you can really sympathize with her ordeal. Note: She has 7 people painting her while she stands there completely naked, for hours, that takes a lot of patience! The video is great because it really gives us a sense of how hard it is to create realistic looking features, and what actors have to go through when they are involved in such a feat. It really makes me appreciate TV shows that featured aliens like in Star Trek: Deep Space Nine, because some characters had to regularly wear heavy makeup . Written by: Katie Shew at 12:55 p.m.